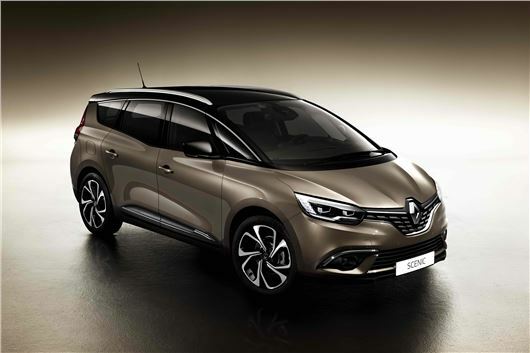 Renault has released the first images of the all-new Grand Scenic, which is bigger, more luxurious and more advanced than ever. It goes on sale around September this year, and although prices aren’t confirmed Renault says it’s likely to cost a little more than the outgoing version, which starts at £22,360. This, the fourth-generation Grand Scenic, comes with five seats or seven and is 24cm longer than the latest Scenic – a substantial leap that facilitates 222 litres of extra boot space and significantly more rear legroom. And so to ensure proportionality, the wheels are 20-inches as standard across the range, which will no doubt ensure the Grand Scenic appears in its fair share of rap videos. Renault is at pains to point out that the standard tyres come with high sidewalls, which the company says will ensure comfort isn’t compromised by the caricature rims. There’s even a two-tone paint option, a BOSE surround sound stereo, and an 8.7-inch tablet display in portrait orientation, with Renault clearly attempting to make this the least depressing MPV there ever was, in a market dominated by big SUVs. It’s all otherwise very sensible indeed, with the seats folding flush with the floor using just one touch, a monster 718-litre boot (in the five-seat version) and automatic emergency braking as standard. The outgoing Grand Scenic has a 702-litre boot. Cabin storage in the new MPV is immense too, totaling 63 additional litres of space including a 13-litre centre console box and four separate under-floor compartments. The engine lineup doesn’t throw up any surprises, apart from perhaps the news there’ll be a Hybrid Assist diesel verson, which links a small electric motor to the 110PS 1.5-litre diesel engine, the result of which is “more responsive performance and lower fuel consumption,” says Renault. There’s a 110PS diesel without the hybrid, available with a manual gearbox or a seven-speed auto, a 130PS diesel with a manual, and a 160PS diesel with the auto completing the range. Two petrol engines are available too, both TCe turbo units with manual gearboxes and either 115PS or 130PS. Renault has said nothing of fuel consumption or CO2 yet, but with the new Scenic range returning 45.6mpg to 68.9mpg with the same engine lineup, don’t expect much change from that. The cabin promises to be airy as Joey Essex’s head thanks to a panoramic glass roof with no mid cross member, while the cabin itself is very modern thanks to the aforementioned touchscreen and a minimalistic design. Folding table should be standard across the range (UK spec is TBC), while tech includes pedestrian detection, lane keeping assist, traffic sign recognition, adaptive cruise control and fatigue detection.